Penguins Captain Kiri Kiri heaped praise onto Scottish side Projecx Waterboys following their 12-12 draw in the final game of Pool B. The penguins, whose last title came in 2016, topped their pool with the most tries scored. “We got ahead early against the Waterboys, but we couldn’t hold them off," said former All Blacks Sevens forward Kiri Kiri, who made his Super Rugby debut this year for the Blues. "They’re a pretty good side and capitalised on a couple of opportunities and gave us a bit of a fight there. We’re pretty happy to take the draw in the end – we looked like losing for a second." Check out morning match-ups for DAY TWO at the #HK10s! ?? Kiri Kiri’s co-captain from 2016, Kylem O’Donnell, was playing for YCAC with his younger brother, Declan. 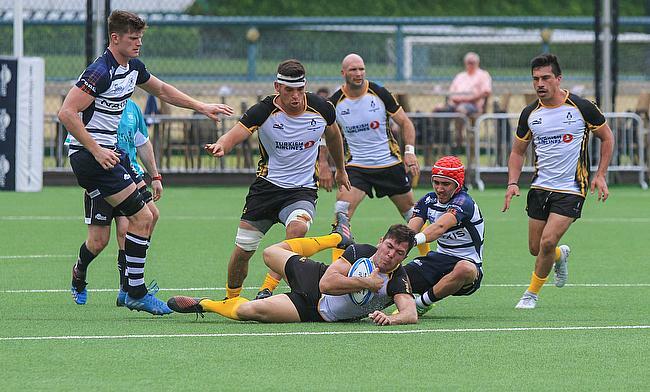 YCAC made hard work for themselves in their victory over debutants CCIG Tigers after their 45-0 victory over Devils Own Shanghai Silver Devils and finished their pool with a 17-0 win against sixth seeded King’s College. “I only got a couple of tries today, but I gave a few assists for the boys as well,” smiled Declan O’Donnell, who moved from the Blues to the Chiefs this year. Day one of the #HK10s opened with a bang ?? Reigning champions UBB found it hard to beat 16th seeded Hunter + Boo East Africans 10-7 in their Pool A opener, then switched up a gear in the 47-0 demolition of A-Trade Overseas Old Boys and had to come from behind to beat the Classic Wallabies 29-5. Former UBB captain and current Head Coach Matt Clarkin is looking to win a second successive title for UBB, but played down his side’s chances as well as his team’s reaction to nearly losing to the bottom seeds. A little bit of #ClassicWallabies magic at the @GFIHKFC10s. “We weren’t exactly happy with our first hit out, but I think we were just finding our feet," he said. There’s a lot of new guys so we’re trying to make combinations and luckily we managed to scrape a win and learned a hell of a lot from it. The all Fijian Samurai squad beat Sedburgh School Old Boys 42-0, this was before they came from behind to beat Taikoo Place Scottish Exiles 34-19 and held on for a draw in the scintillating 17-17 draw against fifth seeded Kir Club Pyrenees.